The Small Magellanic Cloud galaxy is a striking feature of the southern sky even to the unaided eye. But visible-light telescopes cannot get a really clear view of what is in the galaxy because of obscuring clouds of interstellar dust. VISTA’s infrared capabilities have now allowed astronomers to see the myriad of stars in this neighbouring galaxy much more clearly than ever before. The result is this record-breaking image — the biggest infrared image ever taken of the Small Magellanic Cloud — with the whole frame filled with millions of stars. 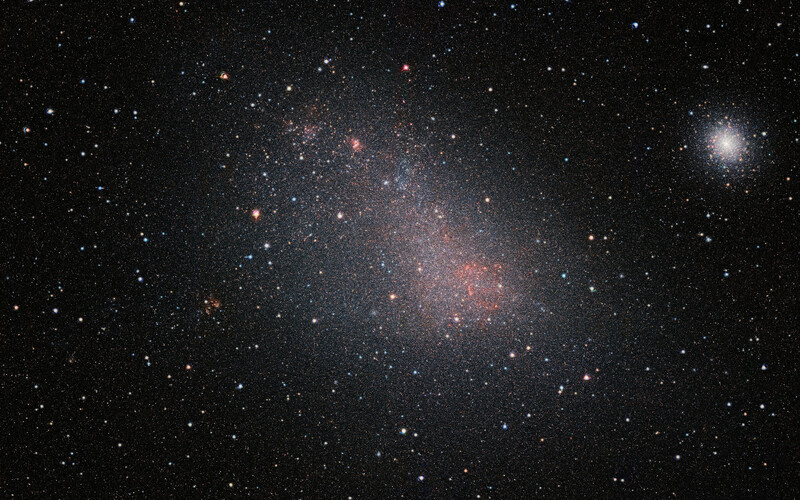 The Small Magellanic Cloud (SMC) is a dwarf galaxy, the more petite twin of the Large Magellanic Cloud (LMC). They are two of our closest galaxy neighbours in space — the SMC lies about 200 000 light-years away, just a twelfth of the distance to the more famous Andromeda Galaxy. Both are also rather peculiarly shaped, as a result of interactions with one another and with the Milky Way itself. Their relative proximity to Earth makes the Magellanic Clouds ideal candidates for studying how stars form and evolve. However, while the distribution and history of star formation in these dwarf galaxies were known to be complex, one of the biggest obstacles to obtaining clear observations of star formation in galaxies is interstellar dust. Enormous clouds of these tiny grains scatter and absorb some of the radiation emitted from the stars — especially visible light — limiting what can be seen by telescopes here on Earth. This is known as dust extinction. The SMC is full of dust, and the visible light emitted by its stars suffers significant extinction. Fortunately, not all electromagnetic radiation is equally affected by dust. Infrared radiation passes through interstellar dust much more easily than visible light, so by looking at the infrared light from a galaxy we can learn about the new stars forming within the clouds of dust and gas. VISTA, the Visible and Infrared Survey Telescope, was designed to image infrared radiation. 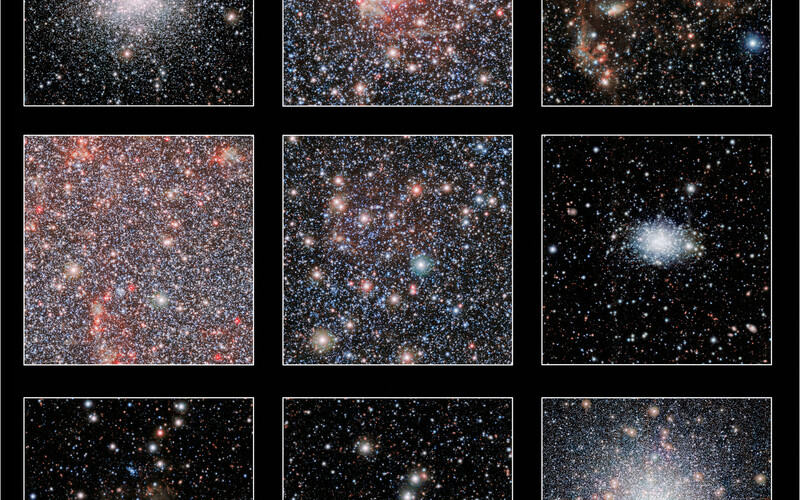 The VISTA Survey of the Magellanic Clouds (VMC) is focused on mapping the star formation history of the SMC and LMC, as well as mapping their three-dimensional structures. Millions of SMC stars have been imaged in the infrared thanks to the VMC, providing an unparalleled view almost unaffected by dust extinction. The whole frame of this massive image is filled with stars belonging to the Small Magellanic Cloud. It also includes thousands of background galaxies and several bright star clusters, including 47 Tucanae at the right of the picture, which lies much closer to the Earth than the SMC. The zoomable image will show you the SMC as you have never seen it before! The wealth of new information in this 1.6 gigapixel image (43 223 x 38 236 pixels) has been analysed by an international team led by Stefano Rubele of the University of Padova. They have used cutting-edge stellar models to yield some surprising results. The VMC has revealed that most of the stars within the SMC formed far more recently than those in larger neighbouring galaxies. This early result from the survey is just a taster of the new discoveries still to come, as the survey continues to fill in blind spots in our maps of the Magellanic Clouds.